Comes amid a push for support among black voters. Donald Trump's continued outreach to African-American voters led to an unprecedented declaration about the state of life for those communities. "We are going to rebuild our inner cities because our African-American communities are absolutely in the worst shape that they’ve ever been in before, ever, ever, ever," Trump said at a rally in Kenansville, North Carolina, on Tuesday night. "You take a look at the inner cities, you get no education, you get no jobs, you get shot walking down the street. They’re worse," he said. "I mean, honestly, places like Afghanistan are safer than some of our inner cities." Michael Dawson, the director of the Center for the Study of Race, Politics, and Culture at the University of Chicago, called the characterization of these being the worst of times for black Americans "egregiously wrong." Dawson pointed to times when "blacks weren't full citizens, blacks didn't have equal rights, either by practice or by law" as some of the lower points in U.S. history, and he isn't the only one to make that point. President Obama responded to the earlier versions of Trump's claims, as Tuesday night was not the first time he has mentioned the state of African-American affairs during the campaign. "You may have heard Hillary's opponent in the election say that there's never been a worse time to be a black person. He missed that whole civics lesson about slavery and Jim Crow," Obama said in an address to the Congressional Black Caucus over the weekend. Trump has made multiple overt attempts to reach out to African-American voters in the past month, including a trip to a black church in Detroit earlier this month, which was his first of the campaign. He later visited another black church in Flint, Michigan, but was scolded by the pastor when he started to make political comments condemning Hillary Clinton. Trump later called the female pastor "a nervous mess." (Evan Vucci/AP Photo) Rev. 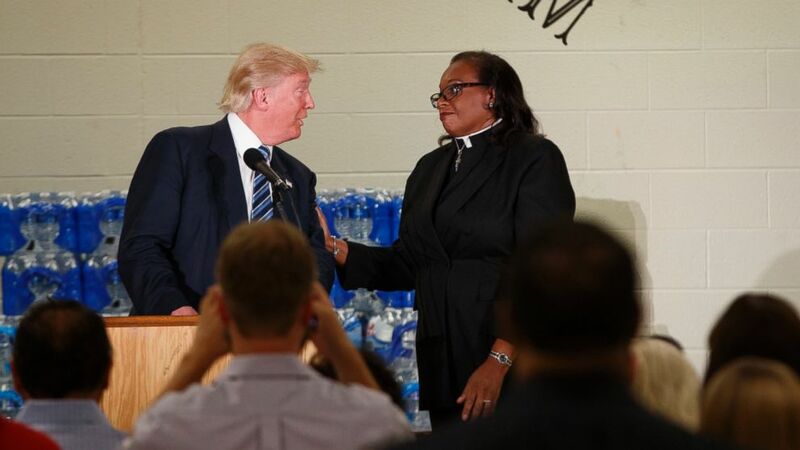 Faith Green Timmons interrupts Republican presidential candidate Donald Trump as he spoke during a visit to Bethel United Methodist Church, Sept. 14, 2016, in Flint, Michigan. Timmons asked that Trump not deliver a political speech, and keep his message to the people of Flint. The facts that Trump has cited to make his point about the state of affairs in African-American communities have come into question, including his claims about how they have been impacted by a loss of jobs and wages in recent years. A Pew report released in December shows that black adults experienced the largest income increase from 1971 to 2015 and were the only racial group to see a decrease in the percentage of their low-income earners. Trump also used to regularly state that 58 percent of African-American youth were unemployed, though his explanation of that figure indicated that he included a larger sample than typically recognized, many of whom would be full-time students not actively looking for work. Dawson told ABC News that Trump's remarks about the black community are likely not actually aimed at black voters but "people who normally would vote Republican but ... they've heard the discussion about Trump being egregiously racist." "These comments are meant to assure these voters that Trump is a not racist, but that he's concerned about the black community and that he has a set of policy recommendations that will help the black community," Dawson said. That said, Trump appears to believe his messaging plan is working. "I think it’s resonating because you see what’s happening with my poll numbers with African Americans. They’re going like high," he said Tuesday night. Recent national polls do show increasing support for Trump among black voters, but they're still in the single digits. In a Sept. 8 ABC News/Washington Post poll, Clinton was leading among black voters 93 percent to Trump's 3 percent. In a CBS/New York Times poll released the following week, Trump's support in the black community had gone up to 6 percent compared to Clinton's 89 percent. Dawson said that he doesn't feel those numbers reflect a true bump in his support among black voters. "If those numbers hold out, he's at the low end of what Republicans have been attracting in recent elections," Dawson said. In 2012, 93 percent of black voters supported Obama and 6 percent voted for Romney. In 2008, 96 percent the voted for Obama. ABC News' Candace Smith contributed to this report.